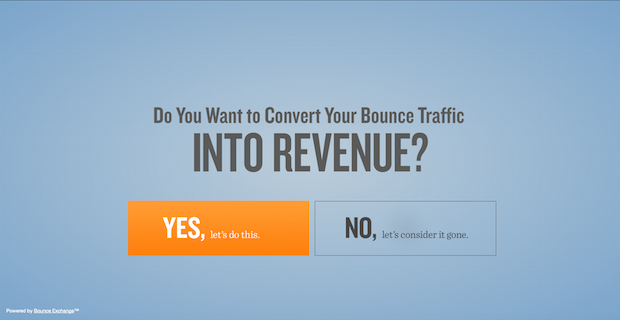 We understand how important it is to increase your landing page conversion rates. Even if your campaign is producing a decent return and you feel your landing pages are doing their job one thing is certain -- there is always room for improvement. Think about it for a minute; unless every single visitor that hits your landing page converts into a lead or sale you can improve your conversion rates through optimization. If you are looking for ways to improve your conversion rates you should consider testing 2-step exit offers on your website. In a previous blog post we discussed the benefits of using a popup offer with exit intent technology, so now we want to explain what a 2-step exit offer is and why they work so well at increasing conversion rates. 2-step exit offers are exactly what they sound like – rather than presenting the offer right away they first ask the user a qualifying question. In the image above you will see a 2-step exit offer from Bounce Exchange, the pioneers of exit intent technology. It asks a very simple qualifying question, and the visitor can either select yes or no. 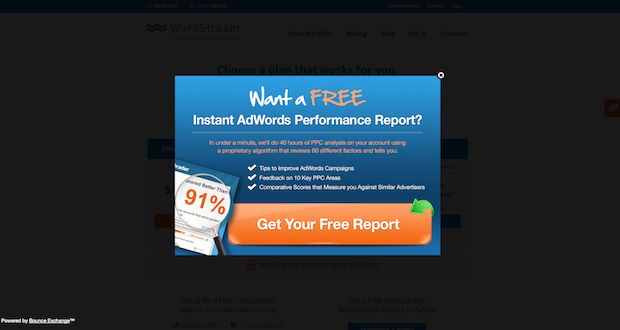 If they click on no the popup is closed, but if they click yes they are taken to a landing page to collect their information, where they are converted into a lead. If someone is presented with a 2-step exit offer and they click through to complete the offer there is a very good chance that they will indeed submit the offer. They don’t feel like the offer was just placed in front of their face. They agreed to complete the offer so when they hit your landing page they don’t have to be sold – they already have intentions of completing the offer. Step #1 of the exit offer was compelling and it caused them to confirm that they are interested. Consumers are very smart, and in fact they are much smarter than most companies give them credit for. 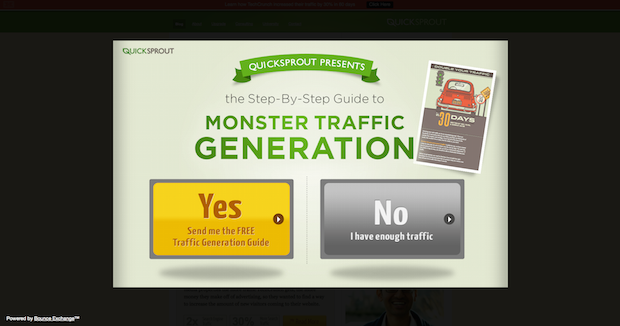 This two-step approach allows you to qualify the individual and only send traffic to your landing page that has a high probability of converting. If you just blindly put an offer in front of your visitor they are likely to just close it out because they didn’t seek it out. Now, if you present them with a 2-step offer that has a qualifying question first you will only attract those visitors that are interested in your offer. While it is still an exit offer, it is less intrusive than one that is lacking the 2-step process. Some of the most successful 2-step exit offers that we have tested for various clients have all have a very fun vibe to them. 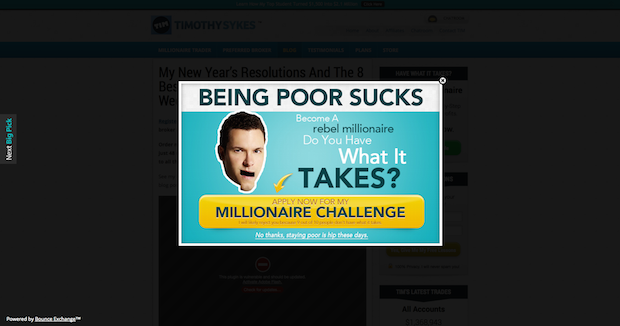 They allow you to utilize a little humor to help push your traffic to your landing page. The majority of offers online are very dry. When you can crack a smile you are able to disable the visitors guard a bit, leading them to consider your offer more than they would if it was plain and boring. This is all subject to testing of course, as every audience is going to react differently to various offers. We suggest coming up with several first-step offers and see what your audience responds to better. Keep two things in mind: what sends the most traffic to your landing page and what converts the highest percentage of users. Don’t just automatically assume the one that sends the most traffic is the winner. If you have one that sends 100 visitors and converts 20 leads it is better than one that sends 500 visitors and converts 30 leads. If you are interested in learning more about our conversion rate optimization services click here to request a free consultation. We help companies of all sizes increase their conversion rates in a variety of industries. Are you the next awesome brand we are going to help online? Get in touch with us and we can discuss a variety of options to help your brand grow online.